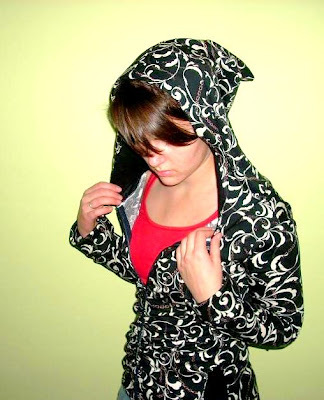 I also made a pretty pretty hoodie out of my favorite fabric EVER-- it has a scrolly design and pink chains all over. I want to keep this one so much, but lucky for whoever buys it, it's listed on my shop (www.mateycouture.etsy.com). 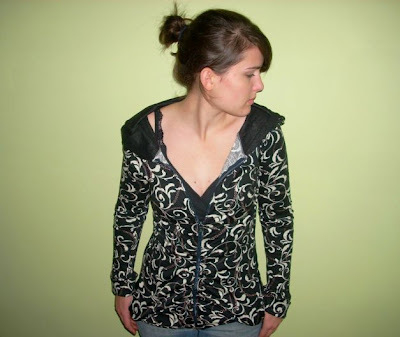 It has pleats up the zipper and up the back, a really long cut, long sleeves, a lined pixie hood, and a zip up the front. On these two pictures I played around with colors/exposure/contrast/brightness at this site I found, www.picnik.com. What do you think? The first one, obviously, has a lot more done to it than the second. Sweet hoodie! How did you put the little flower-leafy things on your fabric? Did you use that awesome computer program, or did you stitch them on? Cuteness! I sent you a e-mail, but looking back, its very goofy and random, so you might have to drink a can of chocolate syrup to find it amusing... Hehe. Hahaha, yes, I got your email, and giggled madly throughout the whole thing. I'm working on a reply to all your post-scripts. :P Do you mean the cherry blossoms on the back? If so, that was a stencil with fabric paint! I had so much fun with it. It's a three part stencil, more extensive than I'd ever done before. But I love it. Thanks for saying such lovely things, Dana! Oooh, and the picture was so much fun to play with. 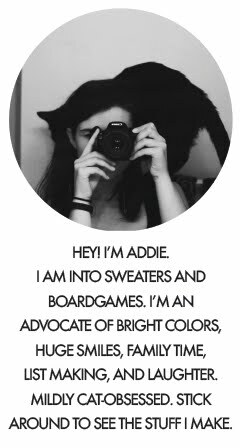 :D I'm going to edit all of my photos on there now.